NASA’s Johnson Space Center, Space Center Houston and the Apollo Flight Operations Association (AFOA) are bringing the excitement of that time back to life with the complete restoration of the Historic Apollo Mission Control Center. By the 50th anniversary of the Apollo 11 mission in July 2019, the room will be fully restored, providing a snapshot of how it looked during the moon landing on July 20, 1969. Initial work and assessments are underway and restoration is scheduled to begin this December. Restoration will include the Mission Operations Control Room (MOCR), Visitor Viewing Room, Simulation Control Room, and the Summary Display Projection Room (“bat cave”), the areas that make up the Apollo MCC - all located in the Christopher C. Kraft Mission Control Center (MCC) at Johnson. The MCC is where NASA’s flight control team planned, trained and executed Gemini, Apollo, Apollo/Soyuz, Skylab and Space Shuttle missions until 1992 including the momentous Apollo 11 and 13 missions. In 1985, the MCC was designated a National Historic Landmark by the National Park Service. Throughout the years, some work was done to partially restore the Apollo MCC to its Apollo-era configuration, but it was not fully restored and continued to deteriorate. The flight control consoles are original and will be fully refurbished. The modules in the consoles will also be reconfigured to harken back to Apollo. Wallpaper and carpet samples are being evaluated against recently identified originals and will be recreated for the room. Johnson Space Center plans to acquire and reproduce the same furnishings that were in the room during that time period: items such as ashtrays, trash cans, and book cases. Space Center Houston, a nonprofit 501(c)(3) foundation, spearheaded the effort to raise funds for the project. While NASA cannot accept public donations that have a targeted purpose, the Advisory Council on Historic Preservation (ACHP) has the flexibility to accept public donations and designate the funds for specific historic preservation projects. The ACHP is an independent federal agency that promotes the preservation and productive use of our nation's historic resources, and advises the President and Congress on national historic preservation policy. Space Center Houston is sending the funds to the ACHP so they can be earmarked specifically for the Apollo MCC restoration. The restoration of this National Historic Landmark will create a space for the Apollo generation to remember an incredible time in history and keep that inspiration alive for the next generation. The lessons learned from Apollo set the stage for subsequent NASA programs, including the Space Shuttle Program, which made the construction of the International Space Station possible, and the Orion Program, which will take astronauts into deep space and farther than ever before. In July 2019, visitors will be able to experience the drama of the Apollo moon landing from the Visitor Viewing Room, learning firsthand how the accomplishments of an earlier generation catapulted the future of space exploration. 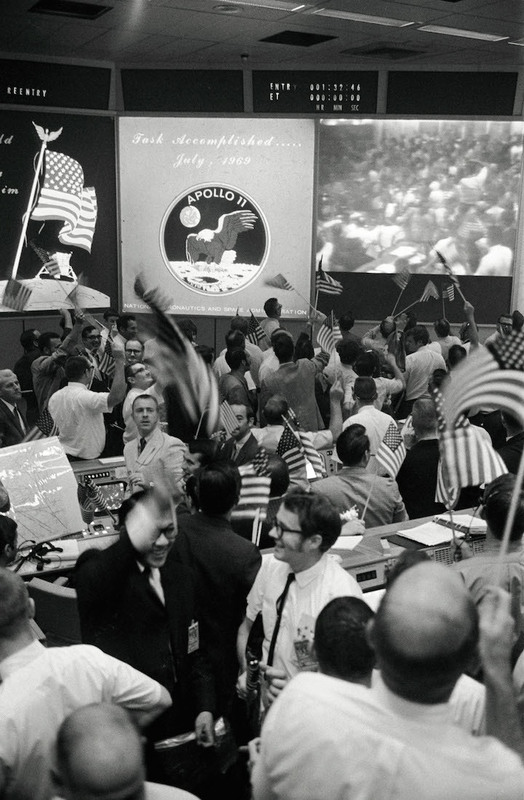 Flight controllers celebrate the successful conclusion of the Apollo 11 lunar landing mission on July 24, 1969, at NASA's Mission Control Center in Houston.